This probes is designed for measurement of magnetic susceptibility of rocks in borehole profile. 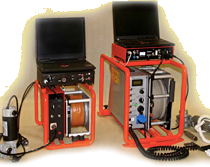 The HM-100 is used for measurement in complex of sedimentary rocks, igneous or metamorphic rocks up to low magnetite rocks. The susceptibility is an excellent indicator of lithology. If required by the customer the chassis of electronics is manufactured to accomodate their communication and power supply modules.